Now that we are officially in the offseason, it’s time to take a look back and evaluate each team’s 2012-13 performance. Next on our list: Arizona. You know, after all is said and done, after all the chatter about his strengths and weaknesses, you gotta say that the Mark Lyons experiment turned out pretty well. Yes, the end of the season and a not-quite-buzzer-beating loss to Ohio State in the Sweet Sixteen is disappointing, and a fourth-place Pac-12 finish isn’t what was expected, but down the stretch, this team was clicking pretty well behind Lyons. With a dearth of other create-for-themselves offensive players (outside of Solomon Hill), Lyons was a pretty good fit here. He never materialized as the distributing floor general some had hoped, but he was a good version of himself — scoring efficiently, playing hard and zipping people up defensively. Despite Some Ups And Downs, You’ve Got To Call The Mark Lyons Experiment A Success, Right? For a team with three hardened veterans among the seven-man rotation, this was a surprisingly inconsistent team. Much of that can be chalked up to three freshmen occupying the rotation at the four and five spots. As talented as Kaleb Tarczewski, Brandon Ashley and Grant Jerrett are, they were still freshmen growing into their bodies and into their games. There were blown assignments, soft defense and the handful of boneheaded plays. But, the bright side is all three of these guys got tremendous experience, displayed their major upside and are expected to return next season. Another day another UCLA coaching search update. With Shaka Smart officially out of the picture, talk about Butler’s Brad Stevens is starting to heat up. First, ESPN broke the completely obvious news that he is UCLA’s top target, while also briefly reporting that Stevens and UCLA were in contract negotiations. Later, FoxSports reported that Stevens was actually in Westwood in the middle of negotiations with UCLA. This report has not been confirmed anywhere, though. However, as should be expected of the calm and quiet Stevens, he’s not commenting on the job at all, other than to say he is still the coach at Butler. And all Butler president James Danko can offer is that he hopes his head coach stats. Elsewhere, N.C. State head coach Mark Gottfried tweeted out that he is “committed” to staying in his current job, which really means nothing, as offering that statement does little but make him have to answer some tough questions if he were to wind up taking the UCLA job. Although you can probably read the tea leaves to find that Gottfried hasn’t received a whole lot of encouragement from those in charge of the UCLA search. One other thing on the UCLA coaching search: for some reason, writers tangentially associated with the Colorado program keep trying to float Tad Boyle as a candidate for the Bruin job. And for no apparent reason. Certainly he’s a fine coach and the job he has done taking the Buffaloes to consecutive NCAA Tournament appearances (and, let’s face it, it should be three straight – CU got screwed in 2011) while building up a passionate new fanbase is commendable. But the UCLA job search would probably have to go pretty poorly, with name after name passing on the job, before Boyle gets hired. Again, no offense to Boyle who I think the world of as a coach and expect to have a bright future, but at this point, as a “deranged buffalo” points out, he just hasn’t done enough quite yet to merit the attention of athletic directors at the six elite “blueblood” college basketball programs. Oh, and in case you forgot, the USC coaching job is also open, though there is nowhere near the speculation about it as there is across town. With some of the top candidates already out of the picture, names like Tommy Amaker, Tubby Smith, Tim Floyd, Mike Hopkins and, get this, Ben Howland, are at the top of the list. Speaking of coaching searches, Oregon head coach Dana Altman has been a party in a couple entertaining searches. First, there was the extended and wildly optimistic Oregon search that wound up landing Altman, only after like 600 (note: that number is only an estimate) other coaches turned down Nike U. But Pac-12 fans may have forgotten the 2007 debacle where Altman accepted Arkansas’ offer for their head coaching position, only to renege a day later after a change of heart. I only bring this up now because, (1) well, I needed an additional point for my morning five, but also because (2) it goes to show just how drawn out and dramatic these coaching searches can be and (3) it is a testament to how lucky Oregon is to have Altman, one of the best coaches in the nation. And, as we wrap up another week, we also wrap up the career of some great Pac-12 players, as Arizona’s demise in the Sweet 16 last night ends the college careers of Mark Lyons, Kevin Parrom and Solomon Hill. Hill, for one, did not go down without a fight, as Bruce Pascoe writes. He scored nine-straight in the middle of the half to rescue the Wildcats from a rough patch spanning the half and to keep his team within shouting distance of Ohio State. While his career at UA is done, he does go down in the record books, tied with Kyle Fogg for most games played in Wildcat history. Madness. After 39 minutes, 40 seconds and change, these two teams were dead even subsequent to a wild exchange of runs. One team killed it for the first 15 minutes, the other controlled the next 20-plus. And then down the stretch it was two prizefighters standing in the middlle of the ring throwing haymakers. Arizona’s seniors Solomon Hill and Mark Lyons threw together a barrage of scoring. Ohio State responded with play-making from Aaron Craft and shotmaking from LaQuinton Ross. And both teams went at it defensively. There was a crazy late run for Arizona to tie things up, but for the second straight game with the clock running down in regulation, the Buckeyes got a huge three-point bucket, this one from the newly confident Ross in the waning seconds, to provide the difference. The Buckeyes Have Found Their Additional Scorers. Much of the year the talk was about “who can Ohio State find to be its second scorer?” DeShaun Thomas has regularly been the leading man for the Bucks, pacing the team in scoring all year long and again tonight. But down the stretch tonight, it was Ross who made play after play after play for them, and in a variety of ways. He scored 14 of the Buckeyes last 17 points and he did it both with the drive, the ability to get to the line and, shown most spectacularly on the final bucket, with deep three-point range. Once a highly regarded recruit, it has taken awhile, but Ross has blossomed in a hurry in March. Meanwhile, Thomas was largely silent late after scoring 20 points in the games’ first 31 minutes. Tale of Two Arizonas. For the first 15 minutes or so, the Wildcats looked like the best team on the court, with Lyons getting to the hole regularly and drawing a couple of fouls on Craft. The freshman bigs were contributing, Nick Johnson looked like the best player on the floor and the Arizona fans in attendance were confident. Then, over about an 11-minute stretch spanning the half, the Ohio State defense turned on the juice, the Cats got frustrated and they gave up a 22-6 run over an 11:24 period. To knock off a team as solid and experienced as the Buckeyes, you’ve really got to play well for all 40 minutes. Star of the Game. LaQuinton Ross, Ohio State. For the second straight game, Ross came up large for the Buckeyes, scoring 17 for the game. Fourteen of those came after the break and all of those came in the last eight minutes. As recently as March 10 against Illinois, he was earning just single-digit minutes, but as the Buckeyes forge ahead into the Elite Eight, Ross has become a major factor, a 6’8” match-up nightmare who can shoot over smaller, quicker defenders or blow by bigger defenders. Previewing Ohio State vs. Arizona: Can Aaron Craft Stop Mark Lyons? Deepak is a writer for the Big Ten microsite of RTC. Follow him on Twitter for more about B1G hoops at @dee_b1g. The Ohio State Buckeyes haven’t lost since February 17 when they took a shellacking in Madison, but since that debacle they have ripped off 10 straight wins and have arguably been the hottest team from the Big Ten. Junior guard Aaron Craft is creating a new role for himself by controlling games in the critical minutes and proving that he isn’t afraid to take the big shot. But standing between the Buckeyes and another Final Four is an equally hot Arizona squad who has won two NCAA Tournament games by an average 20 points. Can the Buckeyes get past Sean Miller’s Wildcats? Let’s assess two key factors that will determine the outcome of the game. Andrew Murawa is an RTC correspondent. He filed this report from the Round of 32 game between #6 Arizona and #14 Harvard at the Salt Lake City pod this afternoon. Physical Mismatch. It was clear just a couple of minutes into the game that Harvard was going to need to catch a lot of breaks to keep up in this game. As good as Wesley Saunders has been all year, he had no chance guarding Solomon Hill in the post. Harvard’s Kenyatta Smith was tough on Thursday against the New Mexico bigs, Kaleb Tarczewski and Brandon Ashley were a whole different ball game. Freshman point guard Siyani Chambers looked overmatched and intimidated early by Mark Lyons, while Nick Johnson and Hill largely stuck with the Crimson’s shooters Laurent Rivard and Christian Webster, using their length, athleticism and confidence in the rest of their team’s defense to limit any good looks. In short, barring some seriously strange goings-on, Harvard never really had a chance in this one. Is Arizona Playing Well?. At times, as the lead hovered somewhere around 20 for the final three-quarters of the game, the Wildcats lost focus and let up some. Kevin Parrom wound up inexplicably fouling out in just 14 minutes of action. Grant Jerrett bruised an elbow early in the first half and never returned. Johnson attempted just three field goals in the 34 minutes of action (to be fair, he made two threes in those attempts). Ashley again showed glimpses of excellence intermingled with frustrating decision-making. But in a game where the talent mismatch was so apparent, it was really hard to gauge just how well this team was playing as a whole. But, give them credit for doing to Harvard exactly what a team with this size and talent should have done to Harvard. New Mexico Redux. If anybody associated with the New Mexico program watched this game, from Steve Alford on down to the lowliest Lobo fan, they had to be going absolutely crazy. A Harvard team that shot a 61.9 eFG% on Thursday night shot 31.9% tonight. 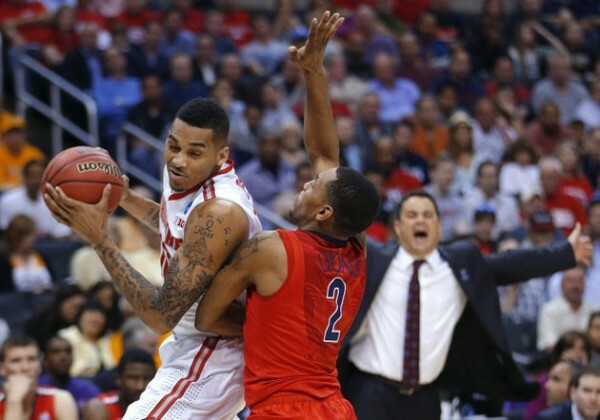 The Lobos definitely didn’t have quite the athletic advantage that Arizona did, but it was pretty close. But, the Lobos failed to close out on shooters, couldn’t stop Chambers’ dribble penetration and never found a guard who could make an impact against inferior defenders. Can’t feel too bad for the Lobos. Star of the Game. Mark Lyons, Arizona. The much-maligned Wildcat point guard had perhaps the best game of his time in Tucson today, getting past Harvard defenders with ease, knocking down threes whenever the mood struck him and zipping up Chambers defensively. With Aaron Craft potentially looming next week in Los Angeles, things are about to get much more difficult, but Lyons has certainly picked a perfect time to peak. Day three of the Pac-12 Tournament is complete, and teams have made their may through the 12 team field to tonight’s championship game. The first team through was top-seeded UCLA, who used an 18-7 run late in the second half to erase an 11-point deficit and pull out a two point win over Arizona. In the second game of the night, Oregon took advantage of a tired Utah team and led the Utes by 14 at halftime before cruising to a 64-45 win. Adams’ Last Game? – UCLA freshman Jordan Adams may have played his last game as a Bruin last night after breaking his fifth metatarsal in his right foot on the final play of the game. Adams led all scorers with 24 points before breaking the foot trying to defend Solomon Hill’s last shot. A few weeks back Adams said he did not want to discuss his future and just wanted to focus on finishing the rest of the season. With his season complete, look for an announcement in the coming days on whether the star guard will go to the NBA this summer. The Pac-12 released its awards and “all-conference teams” on Monday, and I put that in quotes since the conference doesn’t care to follow one of the most simple rules of basketball. Regardless, end-of-the-season awards are always fun to review, so here we go. Leading scorer Allen Crabbe was named the Player of the Year in the conference, with Jahii Carson and Shabazz Muhammad named as Co-Freshmen of the Year. Oregon head coach Dana Altman took home the Coach of the Year award after leading his Ducks to a 23-8 record, and received the honor despite losing their final two regular season games to Colorado and Utah. In addition to Crabbe, Carson, and Muhammad, Spencer Dinwiddie, Solomon Hill, and Dwight Powell headlined the All-Pac-12 first team list. Kyle Anderson, Damyean Dotson, and Josh Scott rounded out the All-Freshmen team. To view the Rush the Court Pac-12 honors and all-conference teams from yesterday, click here and here. Additional news of a Spokane bar fight featuring several USC players broke on Monday afternoon, and not long after, interim head coach Bob Cantu announced that senior center James Blasczyk and junior forward Dewayne Dedmon had been suspended indefinitely for violating a team rule. In a statement released by the school, the program acknowledged the investigation into the alleged incident but refused to comment until more is known. There was an interesting statement from Spokane Police Officer John Gately, which said, “We had a large fight. We have not been able to find any connection to any sports team.” More on the situation will surely be released in the coming days, but the immediate reality is that the Trojans will lose their top rebounder for their opening Pac-12 Tournament game against one of the hottest teams in the league. Uh-oh. Washington State senior Brock Motum has dropped an average of 16.5 PPG against Washington so far this season, and Huskies head coach Lorenzo Romar knows the big Aussie will be the biggest road block between his team and a quarterfinal match-up with Oregon. Even more concerning are the recent stats that Motum has been putting up — he’s scored 20+ points (including one 31-point outing) in three of Wazzu’s last four games, and has averaged 8.0 RPG in that timeframe. The Power Rank has an interesting tool for college basketball addicts, featuring an interactive projected NCAA Tournament bracket and breaking down the probabilities for each of the 68 teams to advance through the bracket. Using Jerry Palm’s projected bracket from March 7 and the site’s calculations from their own rankings, you can see the odds for your favorite team advancing through each round. 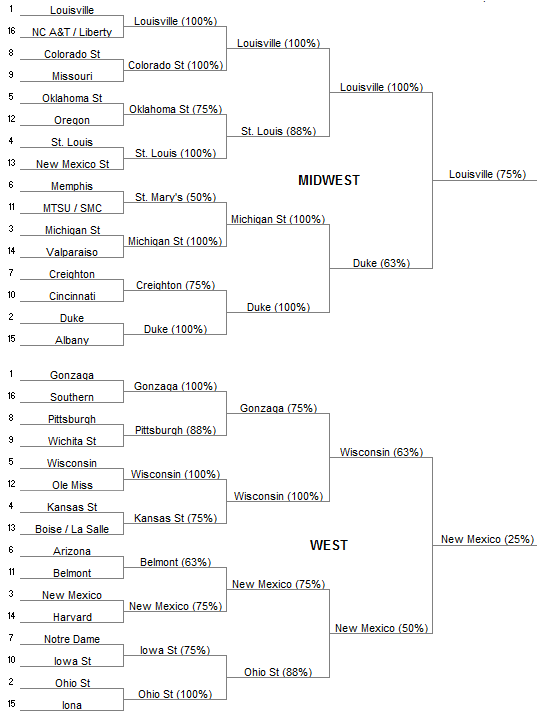 The calculations say Arizona has the best chance of a Pac-12 team to win the national title, coming in at 2.1%. Oregon and UCLA are the next closest at 0.2%, and just as a point of reference, the team with the best chance of winning it all is at 12.8%, Florida. Colorado head coach Tad Boyle has never been angrier at a loss during his tenure in Boulder than he was after Saturday’s head-scratching, 64-58 loss at home to Oregon State. And for good reason, too, as the loss sent CU back to the bubble, a place they thought they were done with coming into the final week of the regular season. In an interesting twist, the Buffaloes now must face the Beavers again in the opening round of the Pac-12 Tournament on Wednesday afternoon, a game that could very well be a must-win in order for the Buffaloes to make the field of 68. On the other end of the court will be the Beavers, which even though they come into the tourney with a #12 seed, are riding some momentum for the first time in a month. Craig Robinson knows all about playing spoiler on Championship Week, as last year the Beavs knocked regular season champion Washington off the NCAA bubble with a quarterfinal win. If history repeats itself, Colorado fans will be wise to root against the likes of La Salle, Virginia, and Alabama in their respective conference tournaments this week, as losses by those teams would help its cause. Going off the same thread, an OSU win would likely mean a second straight trip to the CBI for the Beavers, while a loss could mean being left out of the third-rate tournament. 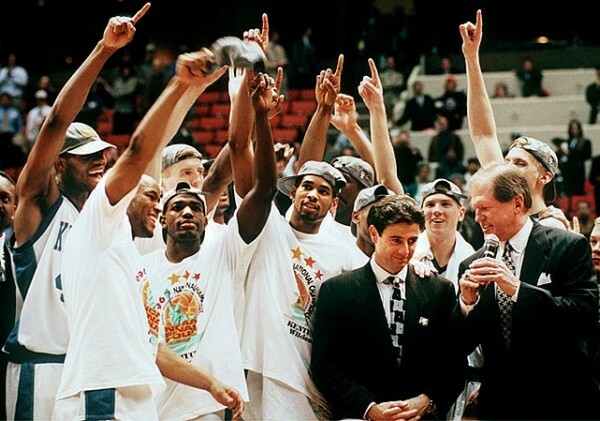 Steve Politi’s Sunday column in the New Jersey Star-Ledger contains some great anecdotal history from the Big East Tournament’s humble inception. To put this week’s highly orchestrated, sold-out event in perspective, consider the following. In 1981, the second year of the tournament, four ticketless Georgetown fans entered the bowels of the Carrier Dome donning various animal costumes, including a penguin suit. Each told oblivious security guards –– who had no clue what a Hoya was supposed to look like –– that he was the official school mascot. And astonishingly, it worked, which merely underscores how many of the league’s most intimate modern rivalries were predated by striking unfamiliarity, and forged only through time and competitiveness. Earlier today we released our picks for the conference awards, handing out, among others, Player of the Year to Allen Crabbe and Freshman of the Year to Jahii Carson. Not surprisingly, those two players lead our picks for the All-Conference team as the only two players to wind up on the first teams of all four of our voters’ ballots. While the Pac-12 goes a little insane this time of year and somehow decides to put together a 10-man All-Conference First Team, we’re going to follow, you know, the rules of basketball and field a five-man team (with a second team for good measure). Jahii Carson, Freshman, Arizona State (17.7 PPG, 5.0 APG, 3.3 RPG, 1.2 SPG) – Our Freshman of the Year, Carson led a resurgence for the Sun Devils, helping his team double its win total from last season and likely earning it a spot in some postseason tournament somewhere. He played 91% of his team’s minutes, and was a catalyst repeatedly for all of his team’s offense. Allen Crabbe, Junior, California (18.6 PPG, 6.0 RPG, 1.2 SPG) – Our Pac-12 Player of the Year, Crabbe paired up with backcourt partner Justin Cobbs to turn around the season for a once-floundering Golden Bears team helping reel off 11 wins in the team’s final 13 games to put them firmly in the NCAA Tournament. Spencer Dinwiddie, Sophomore, Colorado (15.4 PPG, 3.5 RPG, 3.0 APG, 1.3 SPG) – A skillful leader for Tad Boyle’s Buffaloes, Dinwiddie earned a spot on the first team on two of our four ballots. Nearly equally adept at scoring from behind the arc or in the lane as he is at creating for teammates or getting to the line, Dinwiddie blossomed in his sophomore campaign. 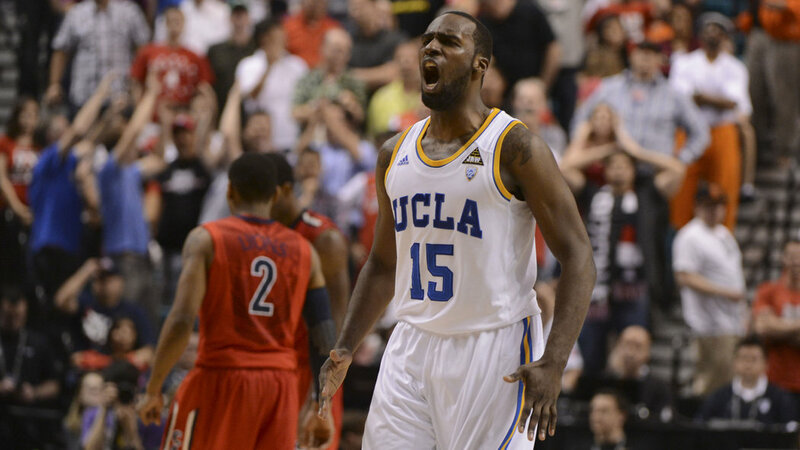 Shabazz Muhammad, Freshman, UCLA (18.3 PPG, 5.1 RPG) – The most-talked-about freshman in the nation, Muhammad came to Westwood with a reputation as a great scorer and he did not disappoint. The nation’s leading scorer among freshmen, Muhammad’s offensive punch was a key factor in UCLA’s run to the conference title. Muhammad was picked as a first team member by three of our four voters. Dwight Powell, Junior, Stanford (15.1 PPG, 8.2 RPG, 1.1 BPG) – A 6’10” jumping jack who averaged less than 20 minutes per game last season, Powell exploded into the upper echelon of Pac-12 players this season, establishing himself as a versatile threat with a promising future on his way to winning RTC’s Most Improved Pac-12 Player award. In advance of Arizona’s senior day, Adam Butler of Pachoops.com offers up his thoughts on Arizona’s three big-time seniors getting ready to play their final home game in front of the McKale Center crowd. I’ll never forget the first time I saw Kevin Parrom play. It was mid-December 2009 and the young New Yorker was tentatively back from a foot injury sustained during preseason practice. He’d played just two minutes in the game prior – his season debut – at NC State. There was significant hype around this one; after all, he was touted as the player Sean Miller had been recruiting the longest who had been released from his Letter of Intent to play for him at Xavier. 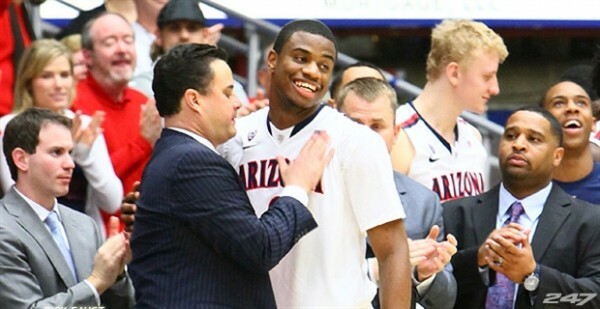 He followed Miller to the desert and became the first Wildcat in the Sean Miller era. Back to the game, many of the details are fuzzy. I can tell you that I’d finagled phenomenal seats and that the final score was a helluva lot to a little. Jimmer Fredette scored many points and my lasting Parrom memory – one of two memories from this game – was his missing of a banked free throw. He’d go 0-of-5 from the line that night. “Indeed a freshman,” I thought. Oh, and my second memory? The four rounds of projectile vomiting I spread through multiple locations across the McKale Center as a result of a bad – nay, miserable – pastrami sandwich from earlier that day. I’d spend the following 36 hours consumption-less, motionless in bed. OK, so enough about me. Kevin Parrom has lived a life of resiliency. This is the young man that has thrice sustained foot injuries that have kept him out of the lineup for extended periods. That’s rough. But it doesn’t hold a candle to Kevin off the court. The Cliff Notes version will have me tell you that in the course of just a handful of months, Kevin lost his grandmother and mother and survived a murder attempt – a moment he’s reminded of every day with the bullet lodged in his leg. I can’t do the story its due tragic justice, so please, read this. These events were more than a curve ball. They were a Mariano cutter dealt to break this young man. But it didn’t. Kevin Parrom is still here and he plays basketball for Arizona and he plays it well. His style is a direct extension of his coach: thorough, hard nosed, direct, and competitive. An even more direct extension of the woman who raised him, Lisa Williams. Which is the backstory to one of the toughest Wildcats we’ve ever had the privilege to watch; the off court resilience just confirming the player who won’t quit on it. Parrom has played any and every role for the Wildcats, most recently being moved into the starting lineup to better capture the energy he plays with. He’s been the spark Arizona needed on countless nights and is a basketball enthusiast’s dream. One might call him a jack-of-all-trades, master of none; to which I might not argue (although he holds the 34th highest ORtg in the nation). But he’s master of knowing which trade his team needs most and when, an asset any coach would want. Whatever Parrom’s legacy is, he’ll be remembered for his guts and his heart. What more could we have asked for from our first – new – Wildcat?